Another Beautiful Day in Paradise. It was a little overcast and a little damp on the Trail. However this big crowd of people showed up. After taking our group picture and considering the safety of skating and getting ones bearings wet, we decided to eat breakfast first. Absentees Chris & Teresa, Karen B, Vicke & Tim, Tony and Charles came. 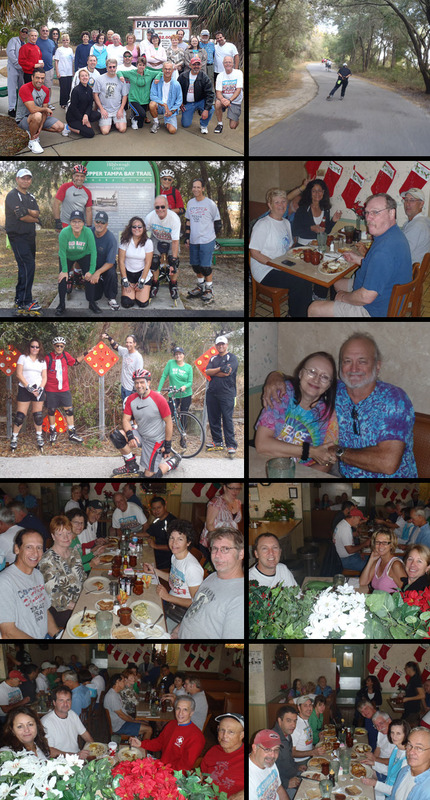 New skaters/bicyclers Della & Bob, Mac and Sandy M came. Welcome all. Out of 27 people that ate breakfast only 9 skated. It was a little wet and slippery in a few places but most all that skated did the full 12 miles. Sandy M got behind and lost and Rick had a bad cold. Most of the trail was fairly dry on the return except the North end which still was a little wet in places. We pretty much skated as one group. Fortunately no one slipped badly or fell. It was a fun and refreshing skate. Claudia and Perry met us at the end of the skate. We brunched at the Garden Grille as planned. At 9 AM they weren't that busy and easily got us seated at 6 tables. Service was good and the food delicious. Rob rated his breakfast a 9.5.